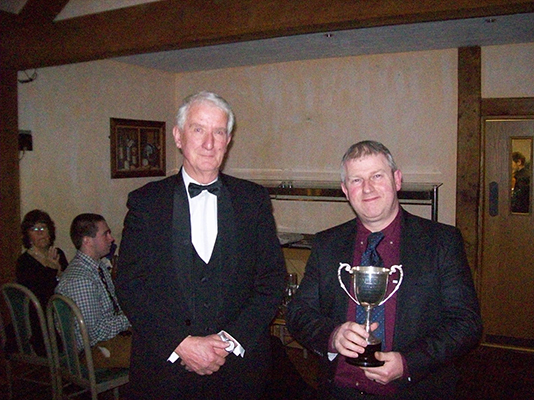 The Annual Dinner of the South Devon Railway Association was held at The Dainton Park Golf Club, in Newton Abbot on Saturday, 19th January 2013. The organisers on behalf of the Association were Howard and May Webster. The cold and snowy weather had unfortunately precluded some of our members attending this year, but the attendance was just over 100. Notable absentees were Sheila and David St. John Thomas, our Patron, but then this was very justifiable in view of them not taking the risk of travelling all the way South from their home in Nairn, in the North of Scotland. The food was of the usual very high standard, and served efficiently by the Dainton Park team. The Speaker was Fiona Iris, a Watch Leader with the Brixham Coastguards, who gave us a brief history of the profession, and outlined their present-day activities. A Draw held on the night, led to many collecting small prizes, but probably the highlight was the chance to ride pillion on a Harley Davidson Motor Cycle. Before holding the main Annual Draw, the proceeds for which are once again being devoted to assist with the Refurbishment of the SDRA Autocoach W228W, the Chairman outlined the history of the Patrons’ Cup. It was noted that this was the tenth year that it had been awarded – previous winners being Bob Saunders (posthumously); Jo Stokes; Allan Lovegrove; Peter Dunning; Nick Perring; Gill and Mike Comben; Chris Woodland; Trevor Stokes and Ron and Margaret Reynolds. The Chairman, using a copy of Bulliver No. 80 issued in the Spring of 1983, highlighted that the Chairman at that stage was Ron Reynolds, the Bulliver Editor was Richard Jones and the Volunteer Footplate Roster Officer was Chris Woodland. All this was by way of getting to announcing the winner of the Cup for the year of 2012, which he declared as Trevor Hodgson – the same man as had been the Project Officer in 1983, and who has served the Association in many ways ever since. The current President, Ron Reynolds, duly made the presentation on behalf of the Patron – see the photograph above.